Discover places to see, things to do and more. Then take your travel guide with you to use while you're here in Texas. 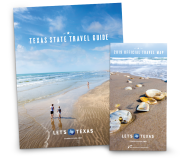 The Travel Texas Guide is prepared by the Texas Department of Transportation. For travel assistance, call 1-800-452-9292. I consent to receive the Travel Texas Guide online. The provision of information is voluntary. I consent to receive the Travel Texas email newsletter and special emails from carefully selected partners. The provision of information is voluntary.